Volkswagen Touareg Boot Space, Size, Seats | What Car? 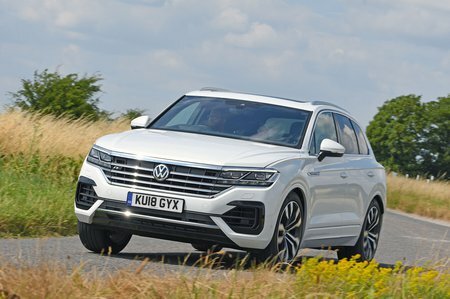 The five-seat-only Touareg may not accommodate as many people as the seven-seat Q7, but that doesn’t mean it’s not a seriously practical SUV. Front space is verging on palatial, and the back seats aren’t too far behind. Not only is there enough rear leg room for six-foot-plus adults, but also head room is equally generous, even with the optional panoramic roof fitted. Only a wide transmission tunnel is likely to cause problems for a long-legged middle passenger, although it is at least lower than that in some rivals. However, the Q7 has even more leg and head room in its rear. Should your rear passengers fancy a snooze, the Touareg’s rear bench can be reclined to three angles, ranging from upright (to prioritise boot space) to seriously chilled. You can also slide the rear bench backwards and forward, depending on how much cargo you’re carrying and how long your rear passengers’ legs are. Moving to the boot, it’s even larger than the warehouse-like Q7’s in five-seat mode, but the two can swallow an equal number of carry-on suitcases. The load area is a square shape, with virtually no loading lip, and there’s a kneeling function that lowers the back of the car if you’ve opted for air suspension. Fold the rear seats down and you’ll find boot space isn’t quite as cavernous as the Q7’s, but it’s still a vast 1800 litres in capacity. In terms of oddment storage, there’s a big cubby in front of the gear selector that can include wireless phone charging, a pair of big cupholders and storage under the armrest. Unfortunately, the under-elbow storage isn’t as big as it initially appears.